Of all the children Oliver Postgate, who has died aged 83, cast his spell over, perhaps none fell under it more than Emily Firmin - the real Emily from Bagpuss. Immortalised in a handful of sepia photos that form the opening credits of the classic childhood TV series, it was Emily who brought her "saggy old cloth cat" to life at the start of each episode by placing before him a mysterious object. "Once upon a time, not so long ago," ran the introduction - voiced by Postgate himself - on top of a sparsely plucked theme tune, "there was a little girl and her name was Emily. And she had a shop." Although only 13 episodes of Bagpuss were ever made, the series went on to become a classic of children's television - these days regularly topping polls of favourite childhood TV shows. Reflecting on the news of the death of Postgate, Emily Firmin, now 43, recalls a "wonderful, generous man [with a] gift for telling children's stories" who was "instrumental" in her decision to study animation and her career choice as an artist. But Emily was no stage school wannabe. Her credentials for the part owed more to family connection than any prodigious ambitions to appear on TV. The youngest of six children of Postgate's creative partner, illustrator Peter Firmin, the choice of Emily - and the decision that the character should share her name - was emblematic of Postgate's unpretentious approach. After all, the Firmin family's home - a sprawling farmstead in Kent - doubled up at the time as the film set for many Postgate classics such as the Clangers and Ivor the Engine, as well as Bagpuss. "The studio was next to my stable in a retired cow shed. It was a real cottage industry. Dad and Oliver worked together as a team. My dad would be in the cow shed and Oliver would be in the old pig sty. "I'd come home from school and bring them tea and I'd have to knock on the door in case they were filming mid-scene." This homespun feel was a big part of the finished product - something which perhaps now lends Postgate's work charm and authenticity, with the emphasis in animation having shifted to computers. "I remember Oliver showing me how the camera worked," recalls Emily. "He had mounted it on a rostrum made of Meccano and because it was stop-animation, you had to start and stop the filming very quickly, so Oliver had rigged up a Morse Code button with which to operate it." And while Bagpuss gave her her starring role, it was the Clangers that made more impact on her as a child. "The Clangers was so much of an event. Their moon took up about half of the barn." Even the frilly Victorian dress that Emily was immortalised in for the Bagpuss sepia title sequence was knocked up by her mother. It was teamed with a pair of "horrible" old shoes Emily had been taken out to buy. And the window of the "unusual shop" inhabited by Bagpuss, Madeleine the ragdoll, Professor Yaffle et al - "was my parent's dining room window", says Emily. Why does she think Bagpuss has retained its appeal after all these years? "The stories allow children to be children. They weren't trying to be trendy and so they've stood the test of time." How does she look back on her association with Bagpuss nearly 40 years after giving up a morning to pose as Emily (for which she was rewarded with a bag of sweets)? "I'm very proud. Everyone is always impressed. I'm always amazed when you get little children sending fan mail - I've had two letters just this week." The public's reaction is almost universally reverential, she says, "although there are a couple of strange responses I get". "Some people are incredulous that I'm not about 80 years old, because those pictures were so deliberately aged… people think they really were from years ago. 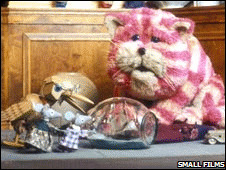 "The other is that there is a generation of people who don't really know Bagpuss at all - they're in their 20s. Those in their 30s and 40s saw it as children and now show it to their kids. But the twentysomethings are a gap." Perhaps the death of Postgate will be a catalyst in bringing new audiences to his timeless work. I loved Bagpuss as a child. My daughter is named Emily, she watches Bagpuss now and loves it. She is four years old and is always asking for the DVD to be put on. It is wonderful that the programme has such a following. It has even reached half way round the world. All the modern children's' programmes make children out to be stupid, which they are not, or make clumsy foolish attempts to be educational in some way. What happened to pure entertainment? I'm 37, Bagpuss had such a profound affect on me, that my daughter's middle name is Emily. I bought the DVD of all 13 episodes and she watches them over and over again. She prefers Bagpuss to the majority of the new children programmes. Thank you Oliver for making my childhood that much more enjoyable and for being able to pass it on to my daughter. I used to watch Pogles Wood in the late 1960s with my daughter who is now 43. I do not see any mention of that here. I'm sure that was a Oliver Postgate and Peter Firmin production. Simple but just right for small children. Non of this high octane rush and scream stuff. Gentle and thought-provoking. What was so great about Oliver Postgate's work was that he made films purely to entertain children, while most kid's TV programmes today are simply extra-long advertisements for toys and products. Toy manufacturers switched from making toys to accompany a TV show, to designing the toys first (which is the real product) then making a TV show about them, which they sell to TV companies. It's cheaper than making lots of adverts, and the TV company actually pays THEM to show it. This is what killed genuine creativity, and ensured that all kids shows are now just a marketers' cash cow. I'm 34. As a boy, Bagpuss used to give me nightmares. Nothing has changed - I am still spooked. I shan't be showing it to my children. Oliver Postgate was a nice man, though, so a number of local people who knew him tell me. I'm 47 and can remember vividly how wonderful it felt to come home from school on a grim winter's afternoon, feeling cold and tired, and then to sit down to watch Ivor, Noggin et al - suddenly all seemed right with the world. For some reason these programmes are always associated with winter for me - perhaps because in the summer we were usually playing out until tea time, not watching the telly. My absolute favourite, however, is Pogles Wood - why on earth hasn't this fantastic series been repeated? I'd watch it now if only the BBC could be persuaded to air it. For me some of my favourite magical Smallfilms ingredients are; Oliver's timeless comforting narrater's voice, Peter's mysterious underground clangers world with the soup dragon, and of course the inspired decision to set Bagpuss at the turn century making its atmosphere even more sad/sweet and dreamlike. I've never seen anything quite like it since. Hats off to Oliver and Peter. I used to watch these brilliant programmes with my two young children in the early 80s. They were on just after lunch and Bagpuss's yawning often made me doze off. Just what children love - familiar characters and stories that catch their imagination. I liked the singing mice best. We're all so much older now but we'd love to see them again. I had the privilege of meeting Oliver Postgate a number of times back in the '70's as a friend lived next door to him in Blean, Canterbury. I remember being invited to have afternoon tea with him, and he very kindly gave my two sisters a clanger each. He really was a kind generous man. I am really pleased he has left such a wonderful timeless legacy that is still being enjoyed to this day! What a wonderful story and a clear indication that the programmes from the 70's truly were focused on children and not profit. Although programmes today are educational they do not come close to the classics. It's the quality & the care that shine through, telling nice stories. Nowadays its all gloss & lack of substance. There will be some bright spark that will say lets remake them just like Bill & Ben or Captain Pugwash, & how many love the remakes. Just rerun them Pogels Wood, Noggin the Nog, Ivor the Engine, The Clangers & Bagpuss. Possibly colour the black & white ones but nothing else. I grew up watching Bagpuss and was always rather jealous of Emily - I wanted to have a shop like hers and a Bagpuss of my own! The Smallfilms programmes hold very fond memories for me, and when I have children I'll make sure they watch them all on DVD! I'm 19, and I only know about Bagpuss because of a Watch With Mother style VHS that my step-father has somewhere in the endless abyss that we call an 'attic'. Also the Greatest Cartoon shows that are on every now and then; who needs CGI when you can make a whole show in your living room with a couple of dolls and a camera. Bagpuss was one of my favourite programmes when I was a little girl. I always wished that I was Emily and that Bagpuss was my saggy old cloth cat. I still fide myself quoting the phrases used by the various characters, especially the mice from the mouse organ as they squeaked "heave, heave". I just have to point out that there are lots of people in their twenties who love and remember the works of Oliver Postgate. Many of the series were repeated on children's television and lots of twenty-somethings and teenagers own Postgate series on DVD and have Bagpuss or Clangers merchandise. If anything, there has been a resurgence of interest in Oliver Postgate's programmes! A gentle man who created programmes for children when they were allowed to be children, the simplicity of the stories allowed for our imagination - not over produced to take any creativity away from the audience. Oliver Postgate was an underrated genius. One of the finest creators of animation that has ever lived. He's up there with Walt Disney and deserves more recognition. He's also a perfect example of the failings of the BBC's commissioning editors. Someone like Postgate and Firmin has no chance whatsoever of getting a pilot on TV today. How many other truly creative geniuses are being shut out of TV and film because of focus groups, and champagne and cocaine fuelled executives, with no insight nor talent?